มีทั้งองค์การและนักรัฐศาสตร์ ที่ทำรายการรัฐที่เสรีและไม่เสรี ทั้งในปัจจุบันและกลับไปในอดีต 2-3 ศตวรรษ โดยที่รู้จักดีที่สุดอาจจะเป็น "ข้อมูลชุดองค์การทางการเมือง (Polity Data Set)" และรายการที่ทำโดย "ฟรีดอมเฮาส์"
ชอมสกีกับผู้ร่วมเขียนยังได้ชี้ด้วยว่า ผู้บุกเบิกสื่อแรก ๆ ที่ทรงอิทธิพลยังมีมุมมองค้านประชาธิปไตยโดยพื้นฐาน คือต่อต้านไม่ให้ประชาชนทั่วไปมีส่วนออกนโยบายของรัฐ นักข่าวนักวิจารณ์ทางการเมืองอเมริกันผู้มีชื่อเสียงคนหนึ่ง (Walter Lippmann) ได้กล่าวในหนังสือ (The Phantom Public) ในปี 2468 ว่าอภิสิทธิชนหาวิธีเพื่อ ขังสาธารณชนไว้เพื่อผู้มีอำนาจจะได้ "เป็นอิสระจากฝูงสัตว์ที่กำลังกระทืบโรงและส่งเสียงร้องอย่างงวยงง" ในขณะที่ "บิดา" ของการประชาสัมพันธ์/การโฆษณาชวนเชื่อ (Edward Bernays) ได้สืบหาวิธีเพื่อ "อบรมฝึกใจของสาธารณชนเท่ากับที่กองทหารอบรมฝึกกายทหาร"
งานวิจัยของธนาคารโลกแสดงว่า หลักการเมืองสำคัญอย่างยิ่งยวดเพื่อจำกัดคอร์รัปชัน หลักรวมทั้ง ระบอบประชาธิปไตยในระยะยาว รัฐสภา ความเสถียรภาพทางการเมือง และเสรีภาพของสื่อข่าว ซึ่งล้วนแต่สัมพันธ์กับคอร์รัปชันที่น้อยกว่า กฎหมายเสรีภาพในการได้ข้อมูลข่าวสาร เป็นสิ่งสำคัญต่อภาระรับผิดชอบและความโปร่งใสของรัฐ ยกตัวอย่างเช่น กฎหมายสิทธิเพื่อได้ข้อมูล (Right to Information Act) ของอินเดีย "ได้ก่อให้เกิดขบวนการของมวลชนในประเทศ ซึ่งกำลังทำระบบราชการที่บ่อยครั้งทุจริตให้พ่ายแพ้อย่างราบคาบ แล้วเปลี่ยนดุลอำนาจโดยสิ้นเชิง"
↑ 1.0 1.1 "Freedom in The World report" (PDF). Freedom House. 2016. ↑ "Christian Business Ordered to Duplicate Homosexual Activist". Concerned Women for America. Archived from the original on 2008-11-28. ↑ "Britain's unwritten constitution". British Library. สืบค้นเมื่อ 2015-11-27. The key landmark is the Bill of Rights (1689), which established the supremacy of Parliament over the Crown.... The Bill of Rights (1689) then settled the primacy of Parliament over the monarch’s prerogatives, providing for the regular meeting of Parliament, free elections to the Commons, free speech in parliamentary debates, and some basic human rights, most famously freedom from ‘cruel or unusual punishment’. "Rise of Parliament". The National Archives. สืบค้นเมื่อ 2016-01-22. ↑ Schmitt, Carl (1985). The Crisis of Parliamentary Democracy. Cambridge: MIT Press. pp. 2, 8 (chapter 1). ISBN 978-0-26-219240-8. ↑ Doomen, Jasper (2014). Freedom and Equality in a Liberal Democratic State. Brussels: Bruylant. pp. 88, 101. ISBN 978-2-80-274623-2. ↑ "Policy Data Set". systemicpeace.org. ↑ Mulgan, Richard; Peter Aimer (2004). "chapter 1, page 17". Politics in New Zealand (3rd ed.). Auckland University Press. pp. 344 pages. ISBN 1-86940-318-5. สืบค้นเมื่อ 2009-06-26. ↑ "India Awakens - Fueled by high-octane growth, the world's largest democracy is becoming a global power. Why the world will never be the same". Time. 2006-06-18. ↑ Levitt, Steven; Dubner, Stephen J. (2006). Freakonomics: A Rogue Economist Explores the Hidden Side of Everything. HarperCollins. p. 14. ISBN 978-0-06-124513-8. ↑ "Propaganda by Edward Bernays". Historyisaweapon.com. 1928. สืบค้นเมื่อ 2010-09-29. 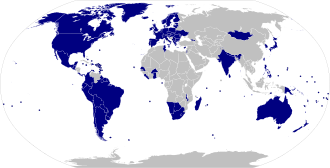 ↑ "International IDEA | Compulsory Voting". Idea.int. สืบค้นเมื่อ 2008-10-28. ↑ . Marshall, Monty G; Gurr, Ted Robert (2005). "Peace and Conflict 2005: A Global Survey of Armed Conflicts, Self-Determination Movements, and Democracy". Archived from the original on 2007-02-06. สืบค้นเมื่อ 2006-08-18. CS1 maint: Multiple names: authors list (link) CS1 maint: Unfit url (link) For illustrating graphs, see "Global Conflict Trends - Measuring Systematic Peace". Center for Systemic Peace. 2006. สืบค้นเมื่อ 2006-02-19. ↑ Chua, Amy (2002). World on Fire: How Exporting Free Market Democracy Breeds Ethnic Hatred and Global Instability. Doubleday. ISBN 0-385-50302-4. ↑ "DPRK Holds Election of Local and National Assemblies". People's Korea. Archived from the original on 2013-03-31. สืบค้นเมื่อ 2008-06-28. ↑ "The Parliamentary System of the Democratic People's Republic of Korea" (PDF). Constitutional and Parliamentary Information. Association of Secretaries General of Parliaments (ASGP) of the Inter-Parliamentary Union. p. 4. สืบค้นเมื่อ 2010-10-01. ↑ Kyvig, David E (1979). Repealing National Prohibition. Chicago: The University of Chicago Press. pp. 6–10. ISBN 0-226-46641-8. ↑ McNamara, Joseph (1994). "Why We Should Call Off the War on Drugs". Questioning Prohibition. Brussels: International Antiprohibitionist League. p. 147. The drug war has become a race war in which cops, most of them white, arrest non-whites for drug crimes at four to five times the rate whites are arrested. ↑ Marks, John (1994). "The Paradox of Prohibition". Questioning Prohibition. Brussels: International Antiprohibitionist League. p. 161. Havelock Ellis wrote at the turn of the century on his visit to America of the zeal of the Christian missionaries during the 19th century ... In an obscure southwestern state he happened across some upset missionaries who ... had come up against some Amerindians who ate cacti as part of their sacrament much as the Christians use wine. The hallucinogen in the cacti, which the Indians interpreted as putting them in communion with their God, rendered them, said the distraught missionaries, "Resistant to all our moral suasions". The missionaries had recourse to the state legislature and cactus eating was forbidden. Between the turn of the century and the First World War these laws were generalised to all states of the Union and to all substances, including alcohol. The Americans adopted prohibition in response to a strong religious lobby for whom all intoxicants were direct competitors for the control over the minds of men. ↑ Dan, Reiter; Stam, Allan C. (2002). Democracies at War. Princeton University Press. pp. 64–70. ISBN 0-691-08948-5. ↑ 49.0 49.1 49.2 49.3 49.4 "The Democracy Advantage: How Democracies Promote Prosperity and Peace". Carnegie Council. Archived from the original on 2006-06-28. ↑ "Right to Information Act India's magic wand against corruption". AsiaMedia. สืบค้นเมื่อ 2008-10-28. ↑ "Harvard Gazette: Freedom squelches terrorist violence". News.harvard.edu. Archived from the original on 2015-09-19. สืบค้นเมื่อ 2008-10-28. ↑ "Published Work Using Economic Freedom of the World Research". Free the World. Archived from the original on 2011-03-20. ↑ McKee, Marin; Nolte, Ellen (2004). "Lessons from health during the transition from communism". British Medical Journal. 329 (7480): 1428–29. doi:10.1136/bmj.329.7480.1428. PMC 535963. PMID 15604170. ↑ Ray, James Lee (2003). A Lakatosian View of the Democratic Peace Research Program From Progress in International Relations Theory, edited by Colin and Miriam Fendius Elman (PDF). MIT Press. หน้านี้แก้ไขล่าสุดเมื่อวันที่ 1 สิงหาคม 2560 เวลา 13:05 น.